Harper is a sensation, a fast-rising surname name with musical appeal. A long list of high profile birth announcements have boosted Harper’s use, from Shonda Rhimes to the Beckhams. Visit a playground nowadays, and there’s a good chance you’ll hear the name. Harper has soared from #887 in 2004 to #118 in 2010 to #16 in 2013. Forty years ago, another ends in ‘r’ name occupied the #1 name in the US: Jennifer. So plenty of parents love Harper, but lots of families also want something different – which now means something just a little bit different than Harper. 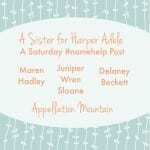 Happily, plenty of names share Harper’s ‘r’ ending, and many share her tailored, frills-free sound. From vintage picks to imports, mainstream possibilities to quirky stand-outs, there’s something for everyone on this list. 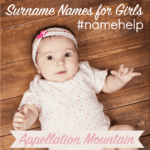 These names are already well established as possibilities for girls. None approach Harper’s levels of popularity – yet. Piper – As musical as Harper, with a boost from television – first Charmed and now Orange is the New Black – Piper entered the US Top 1000 in 2012. Skylar, Skyler – Skylar ranked #73 for girls in 2013, and #541 for boys. It’s gaining for both genders. This one looks like a nature name – and doubtless that’s some of the appeal – but actually comes from Schuyler, a Dutch occupational surname for a teacher. River – The gender-neutral nature name is more popular for boys. In 2013, River ranked #372 for boys and #587 for girls. But River is on the upswing for both genders, and sci fi favorites Doctor Who and Firefly have both given us memorable female Rivers. Summer – Summer has ping-ponged around the US Top 200 for the past few years. Once a hippie chic pick, Summer is mainstream. Christina Aguilera recently chose this name for her daughter. Winter – Trendsetter Nicole Richie named her daughter Harlow Winter Kate back in 2008, and season name Winter went from frosty to white-hot. (178 girls in 2007; 418 by 2013.) It’s the name of the Snow White-like character in Marissa Meyer’s The Lunar Chronicles, and Gretchen Mol has a Winter, too. With the potential nickname Winnie, there’s a sassy, vintage undercurrent to this name, too. You love modern names like Harper, but your partner is all about vintage picks like Hazel. Is there any room for compromise? Definitely! Eleanor, Elinor, or even Eleonore – A name invented for a medieval queen, the powerful Eleanor of Aquitaine. It’s the most classic name on this list, a strong choice for a daughter, rich with nickname possibilities. Eleanor ranked #106 in 2013, and seems headed straight up. Elinor is far rarer, but has the Jane Austen stamp of approval, thanks to Sense and Sensibility. And Eleonore is German – meaning it actually sounds more like Eleonora – but seems like a potential spelling in the US, too. Esther – Another royal name, this time from the Old Testament. The heroic Esther’s name might derive from the goddess Ishtar, but most of the time we associate Esther with the Persian word for star. So she’s one-part Margaret, one-part Luna, with a healthy dash of Harper’s tailored appeal. Leonor – Another member of the Eleanor family, used in Spanish. I assume she lost her El the same way Elizabeth did – the el was interpreted as an article, and dropped. Leonor is much less common than Eleanor, but might work well for parents who want to sidestep the possibility of the Ellie/Ella nicknames. 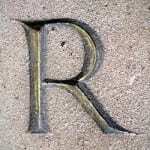 There’s a long list of ‘r’ ending possibilities for a girl, from popular Summer and Winter to the faded Amber. 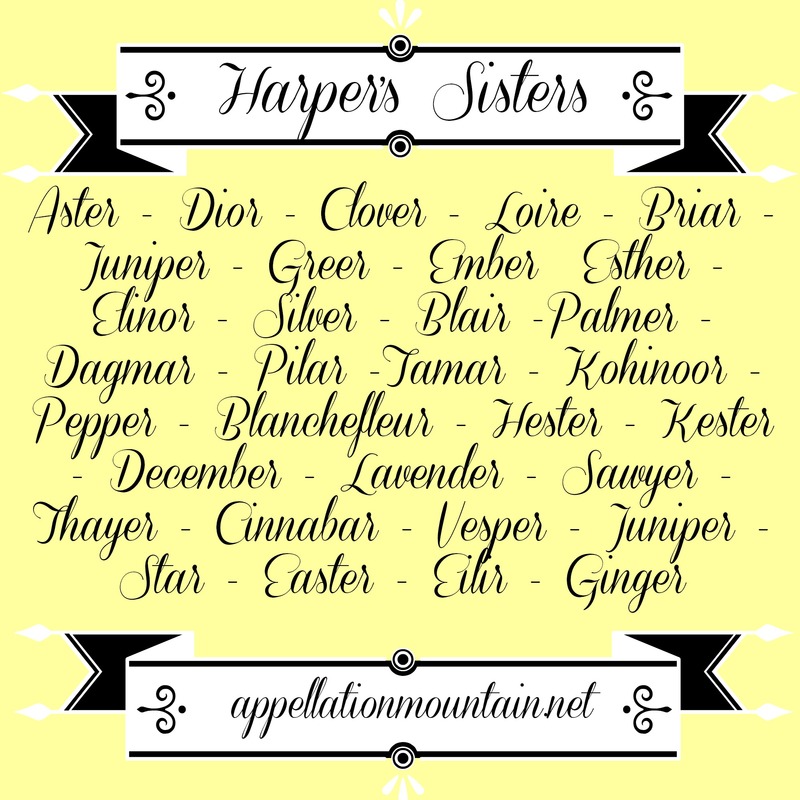 Amber – Amber is now in mom-name territory, but Harper owes her appeal to Amber – and Heather – nature names with the ‘r’ ending from earlier decades. Arbor – Let’s forget the fruity value wines known as Arbor Mist, and just focus on the word. Arbor Day is a day for planting trees, thanks to the Latin arbor – tree. And an arbor is a gazebo-like structure in a garden. The first Arbor I ever met was serving as a flower girl in her aunt’s wedding – perfect, right? Aster – Aster is the Latin word for star – think asteroids and asterisk. But an aster is also a flower. So this should be a smash hit of a name – celestial, botanical, and with that great ‘r’ ending. Except … the potential for teasing makes me think that I’d sooner name my daughter Chrysanthemum. Briar – A long-time favorite of mine, with a Sleeping Beauty fairytale tie, thanks to Briar Rose. While Briar has always been rare, it was once heard almost exclusively for girls, then started gaining for boys – and remains slightly more popular for a son than a daughter. Is that because of the popularity of Brian and Bryce? Cinnabar – There’s more than one origin for this term, but cinnabar is the most common ore of mercury. It’s a gorgeous, deep red color, making Cinnabar a more exotic cousin to favorites like Ruby and Scarlett. Cinnabar is also toxic, so that’s a downer. But how many people know that little fact? My first association with this word is the Estee Lauder fragrance from the 1980s. Clover – Lucky Clover ought to be more popular, don’t you think? Part-Harper, part-Chloe, plus with that great v sound. Neal McDonough welcomed Clover Elizabeth in 2011, and Natasha Gregson went with Clover Clementyne in 2012. 161 girls were given the name in 2013, the highest ever – so maybe her moment is coming. Coriander – Yes to Cora, and yes to Sage, so … Coriander? This one is still mostly found in the spice rack, but it’s not unthinkable to imagine a baby Coriander – of either gender. Ember – Amber’s granddaughter might be fiery Ember. While most of us probably think of coals and ashes, there’s a second meaning to the word. Ember Days once referred to the days traditionally reserved for fasting and prayer in Western Christianity. Fleur, Flor, Flower – Flower was Bambi’s skunk friend, and Flor is most often paired with Maria in Spanish. But then came Harry Potter’s half-Veela, and fully heroic Fleur Delacroix, and this name started to feel like a possibility. Flower is the most easily pronounced in English, but all three have potential. Ginger – Born Virginia, Ginger Rogers danced her way into immortality as the partner of Fred Astaire. There’s also the Gilligan’s Island character, and Miss Duggar, Jinger-with-a-J. While other Golden Age Hollywood names are back in a big way, Ginger was given to fewer than 100 girls in 2013, way down from her peak in the 1950s, 60s, and 70s. Heather – Another early ends-with-r name, chances are that the only Heather in a birth announcement nowadays is the mom. And yet, Heather is a great nature name, with ties to Scotland. If she hadn’t been a hit in the 1970s, Heather would be big today. Hesper, Vesper – In Latin, vesper means evening – as in Vespers, an evening prayer service. In Greek myth, Hesperos was the evening star. (Though actually, it was just the planet Venus, seen glowing in the night sky.) Hesper feels a little clunkier. Sleek Vesper has been worn by a famous Bond girl and a handful of other fictional characters. Both have potential in 2014, but I think Vesper’s v gives her an edge. Hester – As clunky as they come, Hester is a variant form of Esther. She’s also on the edge of extinction, with fewer than five girls given the name in 2013, 2012, and 2011. Juniper – Jennifer’s daughter. Juniper berries are the source of gin – both the flavor, and the name. (In Dutch, juniper is genever.) After years of hearing more and more of Juniper on message boards, the name cracked the US Top 1000 in 2011, and ranked #646 in 2013. Lavender – A minor, but oft-mentioned, Harry Potter character helped boost the possibility of this soft, purple-tinted name. And yet Lavender remains rare – just 47 girls were given the name in 2013.
Pepper – With another reboot of Annie coming out this Christmas, plus the continuing popularity of the Iron Man franchise, will Pepper – as in the orphan and Miss Potts – emerge as a possibility? 152 girls were given the name in 2013, so score one Gwyneth Paltrow’s portrayal of the comic book character. Silver – In our age of Scarlett and Violet, Ruby and Blue, is Silver wearable? The rebooted 90210 gave us Erin Silver, who answered to her surname only. The show boosted the name’s use slightly, but now that 90210 is off the air, it’s hard to say if Silver will catch on. Star, Starr – This simple nature name comes with great expectations. The View alum Star Jones – born Starlet – boosted use of the name. Both spellings peaked while Jones was on the air. Now that’s she out of the spotlight, they’re fading. Zephyr – This one seems better suited to boys, since Zephyros was the Greek god of the west wind. 90 boys were given the name in 2013 – but also 26 girls. Another feminine possibility? The French Zephyrine. While some surnames feel feminine or masculine, most of these are up for grabs for either gender. Astor – I have my hesitations about the celestial, botanical Aster, and yet I’ll mention surname option Astor here, too. Astor comes from a word meaning hawk – meaning that Aster and Astor could both fit on the nature name list, too. But most of us probably think of the wealthy, influential American family. Blair – From The Facts of Life to Gossip Girl, Blair has been a go-to name for little rich girls. Thanks to her similarity to oh-so feminine Claire, it is easy to imagine Blair on a girl. The name ranked #782 for girls in the US in 2013. Dior – J’adore Dior. I know, I know. Luxury brand names like Armani and Chanel and Bentley don’t always feel terribly sophisticated. Rapper-actor-entrepreuneur Sean Combs has a son named Justin Dior. And yet, long before Christian Dior sketched a dress, it was a surname. Possible origins include d’or – golden in French – or Dionysius, from the Greek god. Greer, Grier – Greer and Grier start out as nickname and surname forms of Gregory, heard in Scotland and Norther Ireland. British actress Greer Garson was born Eileen Evelyn Greer Garson – the second middle was her mother’s maiden name. The Academy Award-winning actress helped put Greer in the girls’ camp. Brooke Shields named her second daughter Grier in 2006, another reason we’ve seen an increase in use in recent years. Hunter – Hunter is a favorite choice for boys, masculine but also literary and edgy, thanks to Hunter S. Thompson. But lately, Hunter is heard more and more on girls. It brings to mind the goddess Diana, model-actress Hunter Tylo, and all of those H surname names for girls – including, of course, Harper. While Hunter is still very much Team Blue, ranked #36 for boys in 2013, it looks to be on the rise for girls, too. Miniver – Actress Greer Garson made me think of Miniver – she won her Best Actress Oscar for playing Mrs. Kay Miniver, a British housewife during World War II. The surname might come from an old Cornish saint’s name: Menefrida. There’s a Cornish village called St. Minver, named after a church dedicated to the saint. File Miniver with Endellion and Everild – crisp, tailored, borrowed from history, but wearable for a girl in 2014. A bonus? Miniver shortens to sassy nickname Minnie. Palmer – Palmer wasn’t on this list until I spotted a real girl called Palmer. My first thought? Twin Peaks‘ Laura Palmer, the ill-fated Homecoming Queen with a serious dark side. But the surname is a reference to a palm leaf – and thus, to a pilgrim returned from the Holy Land. In Romeo and Juliet, Juliet tells her suitor that “palm to palm is holy palmers’ kiss” and then calls him a pilgrim. 114 boys and 131 girls received the name in 2013, so it’s not the rarest possibility on this list, and it is one of the most gender neutral. Parker – Like Hunter, Parker is solidly established for our sons. It ranked #74 for boys in 2013. But Parker is catching up for girls, charting at #267 in 2013. As Hunter is to Harper, Parker is to Piper. Sailor, Saylor – Sailor Moon made this one all-girl, as did Christie Brinkley’s daughter. Saylor seems like a creative respelling, but it also has roots as a French surname for an acrobat or a dancer. Sawyer – Another in the Hunter-Parker camp, Sawyer breaks to mind Mark Twain’s Tom Sawyer. Surely an all-boy option! Except Sawyer ranked #120 for boys and #446 for girls in 2013. Spencer, Spenser – I think of two things when I hear Spencer: Lady Diana Spencer, better known as the late Princess Di. And the 1980s television series Spenser: For Hire, based on the detective novels by Robert B. Parker. Both the ‘c’ and ‘s’ spellings have risen in recent decades, though ‘c’ is far more popular. Both are much more common for boys, but not unknown for girls. Taylor – As in Swift. And Lautner. Still a Top 100 choice for girls in 2013, and #371 for boys – but heading towards mom-and-dad name territory as fast as you can Shake, Shake, Shake. Thayer – Here’s my vote for a fresh spin on Taylor, an obscure form of the surname. Thayer has that great Th sound, plus the ‘r’ ending. But this one might go to Team Blue – 44 boys were named Thayer in 2013, and fewer than five girls. Blanchefleur – Literally, white flower. The name appears in medieval French poetry and lore, as in the romance Floris and Blanchefleur. It’s a big name to bestow on a girl, but maybe in the middle spot. December – And September, October, and November, too. December evokes winter and the Christmas holidays, and shortens to Decca or maybe Demi. November could be Nova. I’ve heard of children with all four month names, though they’re far more rare than the springtime April, May, and June. Demeter – You’d be more likely to meet a Demetria, but Demeter is the name for the Greek goddess of the harvest. It’s a name with ties to the Earth, and Demi – as worn by Demetria Lovato and Demi Moore – is an obvious short form. Easter – Remember the Sheryll Crow song “Every Day is a Winding Road”? He’s got a daughter he calls Easter. She was born on a Tuesday night. In years gone by, children born on feast days could be called Easter – or Christmas. It’s been fading for years, though in the 1910s and 20s, there was an uptick in girls by the name. In 2014, Easter reads as deeply spiritual. But it also works as a nature name. Easter comes from the Germanic goddess Ostara – or Eostre – whose name comes from a word meaning dawn, or shining. Ever – Everly is a name to watch, so where does that put Ever? Ages ago, actor David Carradine called his daughter Ever. Then Milla Jovovich and Paul W.S. Anderon welcomed Ever Gabo in 2007. Blogger C. Jane Kendrick has a daughter by the name, proof that Ever wears well outside of Hollywood. 109 girls received the name in 2013 – as well as 121 boys. This isn’t a case of a word name used for both genders, though – in Spanish, Ever and Eber are traditionally masculine, from the Hebrew – as in the ancestor of the Israelites, who refused to help build the Tower of Babel and thus preserved his language. Honor, Honour – Jessica Alba’s older daughter is Honor, born in 2008. The high profile birth announcement helped boost the virtue name. Honor is just a little bit edgier than Hope and Grace, but still a traditional, feminine choice. English actress Honor Blackman played a Bond girl and The Avenger’s Cathy Gale. 133 girls were named Honor in 2013, plus an additional nine with the British English spelling, Honour. Every name has roots, but Imports are names that feel distinctively foreign. They can sometimes pose pronunciation challenges, though this batch is pretty accessible for an English-speaking audience. Dagmar – Yes to Ingrid and Astrid and Sonja, too, but how ’bout this Scandinavian import? Dagmar was a medieval queen of Denmark. Eilir – I’ve seen Eilir listed as a Welsh name meaning butterfly, and a handful of women bear the name. But I can’t confirm the name’s origins, and she’s pretty rare. Still, the sound – AY ler – is undeniably on trend. Jesminder – Remember 2002’s Bend it Like Beckham? The soccer-playing Indian girl at the heart of the movie is Jess, short for Jesminder. It’s always stuck with me as a very wearable import – especially with that go-to nickname. Jem could work, too. Katar – Qatar, like the Middle Eastern nation, you ask? No. Katar, an Armenian name meaning summit. It’s rare, rare, rare … but I like it. Kester – A medieval nickname for Christopher – and for a boy. But Bess, Tess … why not Kess? And Kester might feel fresher than Hester to some. Kimber – Kimberly was big in the 1960s, but today is just Kimber on the rise. Back in the 1980s, Kimber was a member of animated rockers Jem and the Holograms. As of 2013, this name ranked #659 – and climbing. With the Jem and the Holograms movie due out in 2016, who knows how high she could go? Kohinoor – This one might make my guilty pleasure list! The Kohinoor – or Koh-i-Noor – is among the world’s largest diamonds. The name means “mountain of light,” and a diamond mined at the same time is the Daria-i-Noor – “sea of light.” It became part of the British crown jewels during the time of empire, and can be seen in the Tower of London. As a given name, Diamond feels awfully sparkly. But Kohinoor? A little eyebrow-raising, maybe, but somehow it feels more subtle. Lior – This gender-neutral Hebrew name means “light for me.” It’s a truly daring possibility, less flashy than Dior, more daring than Harper. Loire – The longest river in France, pronounced as one syllable: lwahr. That’s not the most accessible pronunciation, but with French names and place names so in vogue, it’s worth considering Loire – far less expected than Paris. Noor – This is really the wearable part of the name – Noor, from the Arabic word for light. Queen Noor of Jordan – born Lisa Haleby – put the name on the international stage. Pilar – In English, it seems crazy to name your daughter pillar – even though pillar of the community, pillar of strength, and so on give this name a virtue vibe. But Saint James reported since Mary appear to him on pillar in Saragossa, Spain, making Maria del Pilar – and just Pilar on her own – a spiritually significant choice. Sahar – Sahara is a desert, but Sahar is a Persian word meaning dawn, and an Arabic word meaning moon. Hmmm … maybe this one belongs in the nature name section instead! Tamar – Wildly popular for girls in Israel, Tamar is an Old Testament name meaning palm tree. It’s rare in the US, never cracking the Top 1000, but could wear well. What are your favorite girls’ names ending in r? Are there are any other names that should be on this list? My neice is likely the only half sth African jewish 4 yr old in Australia with an Indian name. Priya. My brother works in IT with mostly new Australians from the India, Pakistan etc region. Why can’t your child’s name reflect your journey in life without feeling appropriated, patronising or requiring a greater story/meaning. Holy moly, this is an extensive list. I didn’t realize I was such a fan of the ‘r’ ending, but many of these are my list, too. Thanks for introducing me to Eilir and Liore, lovely names with great imagery. Oh, and here’s a little trivia for Coriander. In “The Neverending Story,” the shopkeeper’s name is Carl Conrad Coreander, or Karl Konrad Koreander in the German version. Carl Conrad Coreander?! That’s fabulous! 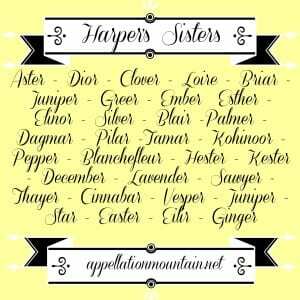 I lurrrve this list, which is interesting since Harper isn’t a name I find particularly appealing. Clover, Winter, Noor and Ever have been favourites of mine for a very long time now, they are just gorgeous and I could easily see myself using them. And how stunning is Loire! That was a great pick. I kind of have to question the appropriateness of “importing” names like Jesminder and Noor. The idea of a white American girl named Jesminder is just odd. All of us white folk have no problem imagining names like William and Emma on people from non-Euro cultures, but I think we should take a serious look at why that is. Additionally, why do we feel that it’s appropriate to “import” names from cultures that are so vastly different from our own? What do we really know about Jesminder other than the fact that it was used for the main character in Bend It like Beckham? You’ve raised a really good, really important point – and I’m so glad you did. I think there are two issues: the parents’ motivations for choosing the name, and the child’s experience in the world with the name. For the parents – I’ve known and known of a handful of families who have chosen non-Western names because either a) they’ve lived there, may intend to spend time there in the future, and the choice comes from a deep respect for the culture. Uma Thurman is probably the classic example – her father is a Buddhist scholar, raised his kids Buddhist, calls the Dalai Lama a friend. So here’s this woman known for her mane of golden blonde hair, and it seems perfectly reasonable that her given name is Sanskrit and relates to a Hindu goddess. And then b) I’ve also known families that absolutely have the appropriate heritage to use the name – but it isn’t immediately obvious. If you’re half-Japanese, but your husband is of European descent, you may still want to pass on your grandmother’s name … even if your Irish-German-English-Japanese Midori won’t look much like great-grandma. It’s fuzzier when the parents have a less meaningful connection to the language/culture. In some cases, parents want to avoid Western names because, well, they’re not white. Or their children won’t be. But if they’re not up on their heritage – or don’t feel close enough to any one aspect of their heritage to draw inspiration for names – it can be tricky. There’s a growing pool of names that strike me as the “mainstream non-Westerns” – Kai, Aaliyah, Bodhi, Amira, Amaya, Omar. To varying degrees, they seem open for anyone to use. There’s much more complexity here, but the core question really is: What if you see a name on a baby name blog and you LOVE, LOVE, LOVE it, but you’ve never heard it before, have no connection to the culture/language/heritage, and just think it would be cool to choose an out-there name with non-Western roots? This is where I’m stuck. Because I’m always a little surprised when parents say, “Oh, we just liked the name.” That feels thin to me. And yes, can smack of cultural appropriation. And of course, names like Kai and Amaya weren’t always mainstream. I do think that if the name is the tiniest bit familiar in the Western world – like Jesminder from the movie – it is worth adding to the list. Because there may be some parents who see Jesminder and realize, for whatever combination of reasons, it works. And now to the child’s experience. If your name is surprising or unusual in any way, you may have to explain it. (I just met another parent at my kids’ school, and she’s named Sigrid. And she’s definitely not Scandinavian. Oh, I am dying to ask …) It seems like your child deserves a strong story. It’s okay to be Emma because your parents loved it – no one is asking – but if you’re going to be Lotus or Soraya or Uma, and you look like Elle Fanning, well … there may be curiosity. Now, the thing is that you can be very aware of names and their meanings and origins and stumble into something that might strike others as odd. Our daughter is Clio, right? So I’m talking to our new neighbors, who are lovely and warm and whose son is a great new friend for my son. And I’m introducing my daughter. To African-American parents. And the mother looked ever-so-slightly surprised to be introduced to a white girl with the name of an Egyptian queen. “Is it short for Cleopatra?” she asked, and I could hear the wheels turning. Never thought of it. In six years. While writing a name blog every day. On balance, I’m more frustrated by our tendency to be dismissive of non-Western names, particularly African-American naming traditions. And I feel like that’s a place where I’ve grown and learned quite a bit. So it is appropriate? Sometimes yes, sometimes no. But it is a good, important question to ask. Let me think about it some more, and again, thank you for raising it. Great comment, Abby! A blog post in itself I think. I’ve thought a lot about cultural appropriation (I am mixed race). Including “imports” on a blog list doesn’t scream “bad idea” to me… just because you’re white doesn’t mean your readers are. Maybe you’ve opened up new options for people who like the feel of a top American name (perhaps they’re 2nd or 3rd or more generation, or simply like the name and are looking for something less popular, as the post intro suggests) and are looking at what they could consider a “heritage” choice in a different light. But if you’re not from that culture? I think the bottom line is that if you appreciate something beautiful about a culture and can use it in a way that honours that culture that is not disrespectful to same, then go ahead. Ideally everyone would think critically about these things and make smart choices but I know that that is not a reality. I think I would rather someone hear someone say that they named their daughter Lotus because they liked the sound of the name or that it is their favorite flower, than that they named their daughter Lotus after an unpleasant character in a great novel. I think to scream about cultural appropriation is form of racism. Members only can use this name.People shouldn’t have to justify their naming decisions. Thinking a naming choice is odd does not equal inappropriate. Yep, the University of Wales Dictionary (http://geiriadur.ac.uk/gpc/gpc.html) says that Eilir means butterfly, and also ” spring, vernal equinox; regeneration, renewal, second freshness”. Very nice meanings! Esther is my favorite name from this list. I also like Dagmar, River, and Pilar.